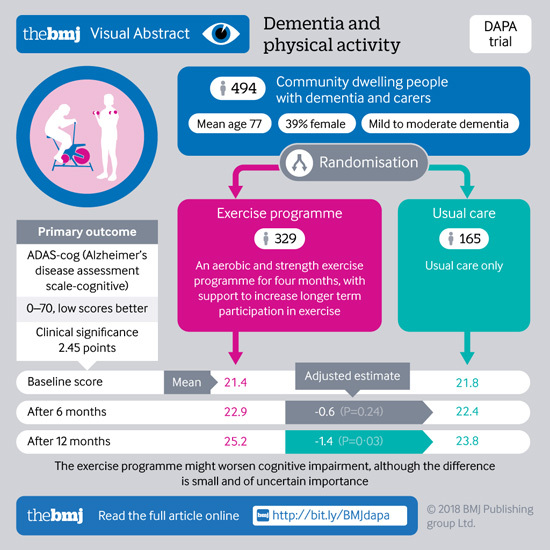 Moderate to high intensity exercise does not slow cognitive (mental) impairment in older people with dementia, finds a trial published by The BMJ. Although the exercise program improved physical fitness, it cannot be recommended as a treatment option for cognitive impairment in dementia, the researchers say. To try and resolve this uncertainty, a team of UK researchers decided to estimate the effect of a moderate to high intensity aerobic and strength exercise training program on cognitive impairment and other outcomes in people with dementia. General health and fitness was assessed at the start of the study and participants were randomly assigned to either a supervised exercise and support program (329 patients) or to usual care (165 patients). The program consisted of 60- to 90-minute group sessions in a gym twice a week for four months, plus home exercises for one additional hour each week with ongoing support. The main (primary) outcome was an Alzheimer's disease assessment score (ADAS-cog) at 12 months. Other (secondary) outcomes included activities of daily living, number of falls, and quality of life. The exercise group showed improved physical fitness in the short term, but higher ADAS-cog scores at 12 months (25.2 vs 23.8) compared with the usual care group, indicating worse cognitive impairment. However, the average difference was small and clinical relevance was uncertain. The researchers point to some trial limitations. For example, participants and caregivers knew which group they were in, and the period of structured exercise may have been too short to produce positive benefits. However, strengths over previous trials included a substantially larger sample size and high levels of follow-up. "This trial suggests that people with mild to moderate dementia can engage and comply with moderate to high intensity aerobic and strengthening exercise and improve physical fitness," the authors say. "These benefits do not, however, translate into improvements in cognitive impairment, activities in daily living, behavior, or health-related quality of life," they add. They suggest that future trials should explore other forms of exercise, and that investigators "should consider the possibility that some types of exercise intervention might worsen cognitive impairment."